We had booked a cab for 7.30. We were not that consolidated. It took two trips to get our collected bags downstairs. We arrived at East Perth station we thought really early, but there were others who were earlier! A young man on a guitar played and crooned to the ever increasing throng of people. The train is 32 coaches long. The majority of the carriages are Gold Service, the accommodation we are booked on. This provides us with an individual compartment with a comfortable couch that lets down into a bunk bed arrangement, plus en suite bathroom. They have apparently discontinued the Red Service carriages without sleeping accommodation. There still some platinum carriages whose giddy heights of luxury can only be imagined. 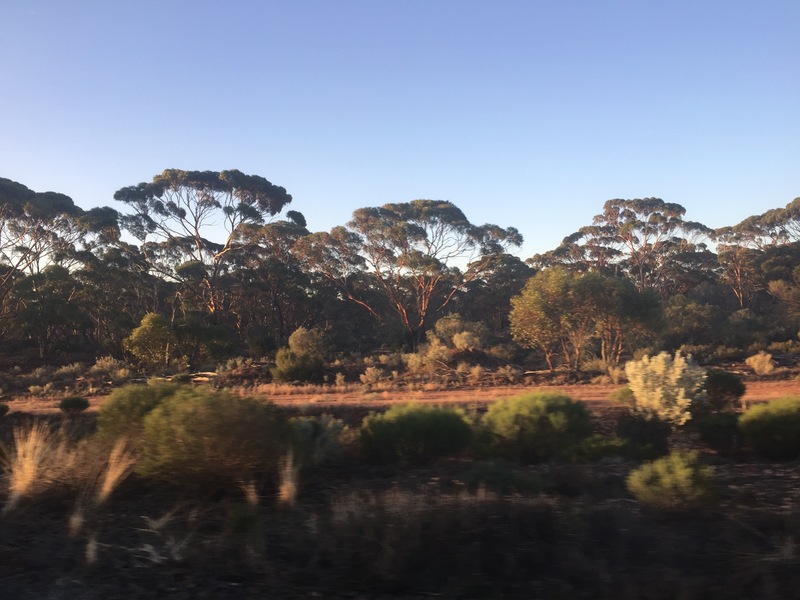 Every few Gold Service carriages there is an Outback Explorer lounge for general use, viewing and socialising with a bar and occasional tables and at the end of each of these is a dining car. Coffee and cakes are being served when we arrive and the train’s staff, suitably uniformed in smart jackets and felt, brimmed hats ( no corks!) are mingling. We sit down at a table and chat to a couple from north of Sydney. Time passes and after a rousing version of Waltzing Matilda from our musician, we are eventually encouraged to board the train. We are in compartment I 5 or, as Keith helpfully points out to aid my deteriorating memory, High Five. Sometimes he can be too helpful! At 10.00 am we leave. After a briefing from our compartment attendant, ably supported by her colleague Wednesday (I cannot believe that is her name! ), and after identifying which trips we want to take part in (all part of our Gold Star service!) we settle down to our journey. Oops! Not quite. The next person to appear is the meals person, who nurtures us through sittings and timings. And then we settle down to the journey. 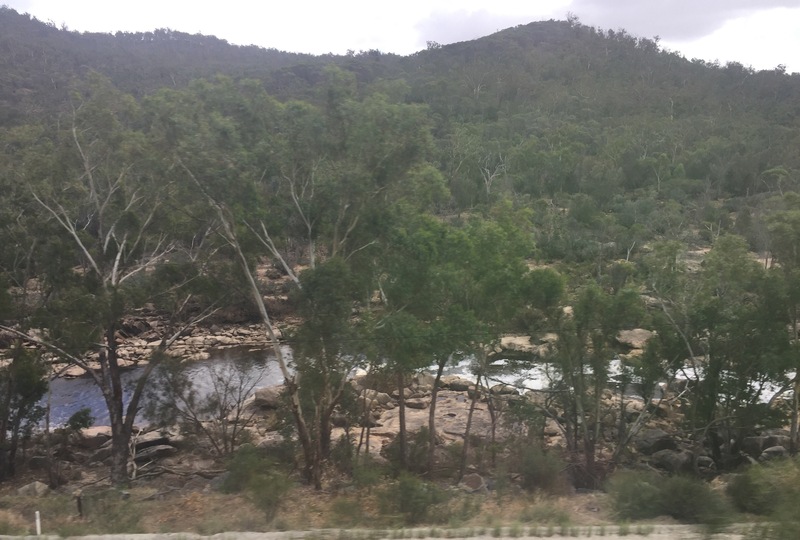 Once we are out of Perth, we are very soon out into the countryside and before long travelling parallel to a tree lined river valley as it follows its course over rocks and boulders. We then move out into a cleared landscape and we are in the grain belt. Harvested fields stretch out to the horizon. We pass the occasional homestead, but mainly it is acres and acres of stubble. 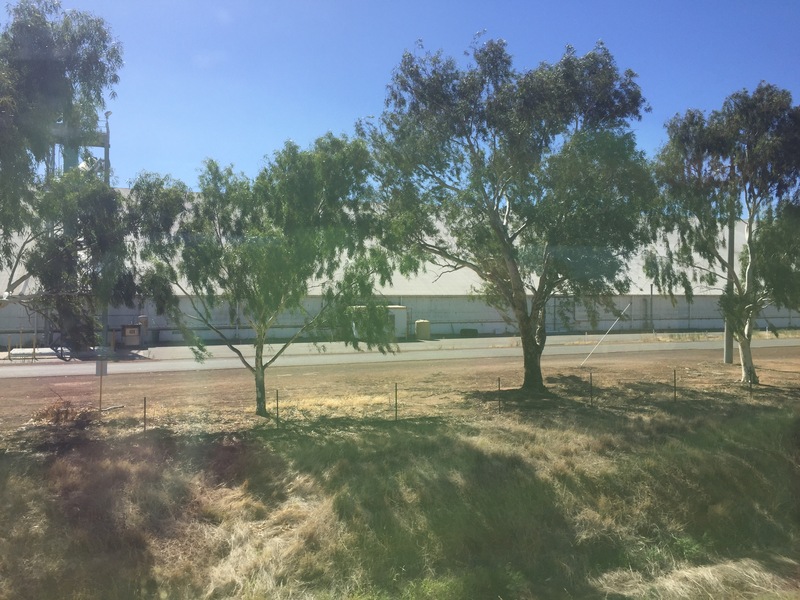 At one stage we passed a huge grain store that seemed to go on for ever! There was a small township there called Merriden. We adjourned to the Explorer Lounge for a pre lunch drink. I could not resist a few bubbles to celebrate being here. It’s funny, there always seems something to celebrate….! Lunch was far too good. All the good resolve of the past 6 weeks could be seriously undone by a few days on this train! The salted caramel and macadamia nut and honey ice cream was just too nice. Where is my resolve?!? The afternoon moved on, as did the scenery and light. Just before sunset we were passing some beautiful trees with their leaves shining in the fading sunlight. They were mesmerising. We had dinner at about 6.30. I had eaten to much for lunch so just had the main course of fillet steak and then helped our meal companion (Trish?) with her cheese…. it seemed churlish not to, but these Australians need to learn about cheese needing to breath before eating. Now for the last couple of weeks at this time I would have been creating our bed. But no. Not tonight. Because we had an evening outing! 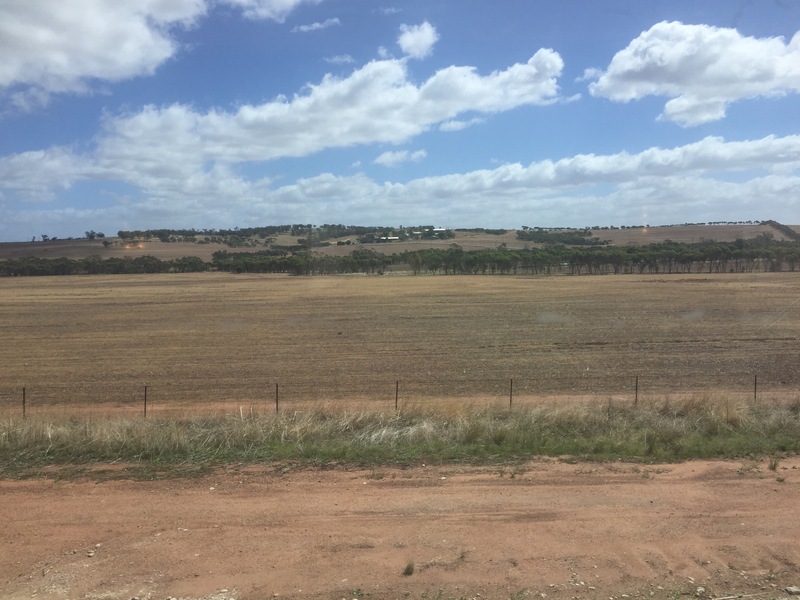 Much to our dismay we were going to Kalgoorlie, the probably most famous of gold mining towns, at 8.45. If we were to see it, it had to be this evening. Hence the late night outing! So, discreetly trying to suppress our yawns, we joined our fellow travellers in leaving the train at just after 9.00. We were off to see a gold mine. Not any old goldmine, but the world’s largest open cast mine. As usual, let us go backwards first. 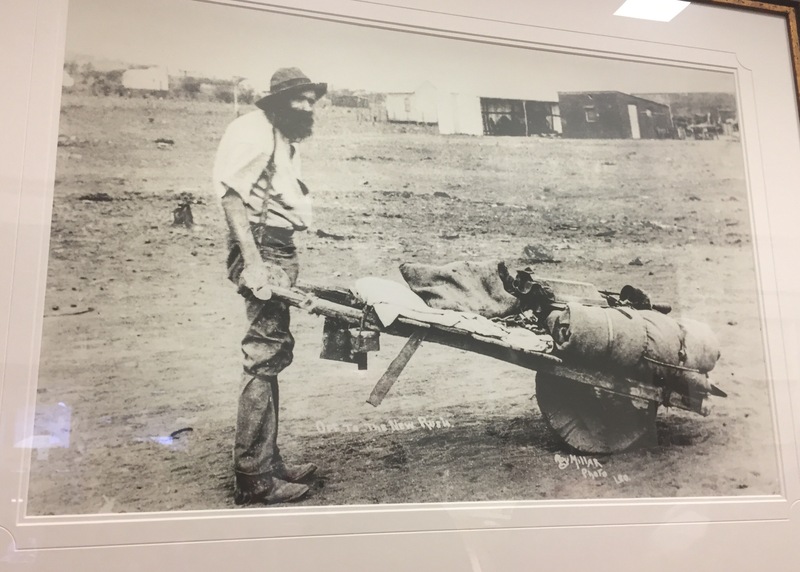 Kalgoorlie, now teamed up with its neighbouring town, Boulder, and called Kangoorlie Boulder, began it’s days of glory in 1893 when three down-on-their-luck Irishmen, Patrick Hannan, Tom Flanagan and Daniel O’Shea came across 100 ounces of gold just lying on the ground near a sandy water course, when they were forced to stop to replace a shoe on their horse. While the others staked out their claim, Patrick Hannah rode the three days to the nearest town to register it. Almost immediately other men rushed to the spot where this amazing find had taken place. The Goldrush had begun. 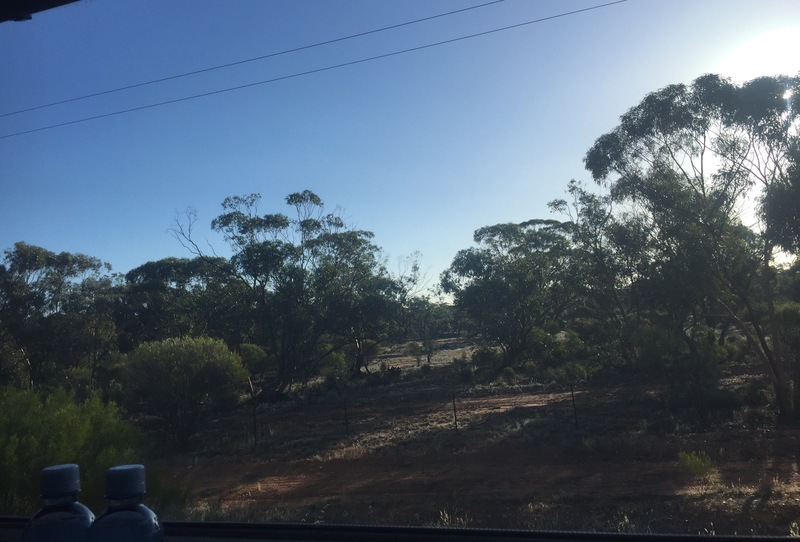 Kalgoorlie is now a town of 30,000 people and is the largest outback town in Australia. It has some very splendid Victorian buildings, not to mention one hotel with a definite Alfghanistan architectural influence, a tribute to the Afghanistan camel men who drove their camel trains across the desert to supply food, water and equipment to the miners. Some of the buildings are quite grand as of course money was no object to those who found gold. The clock tower even has a gold dome on top. In its day, Kangoorlie boasted 96 hotels. I was surprised to learn that it still boasts 27! 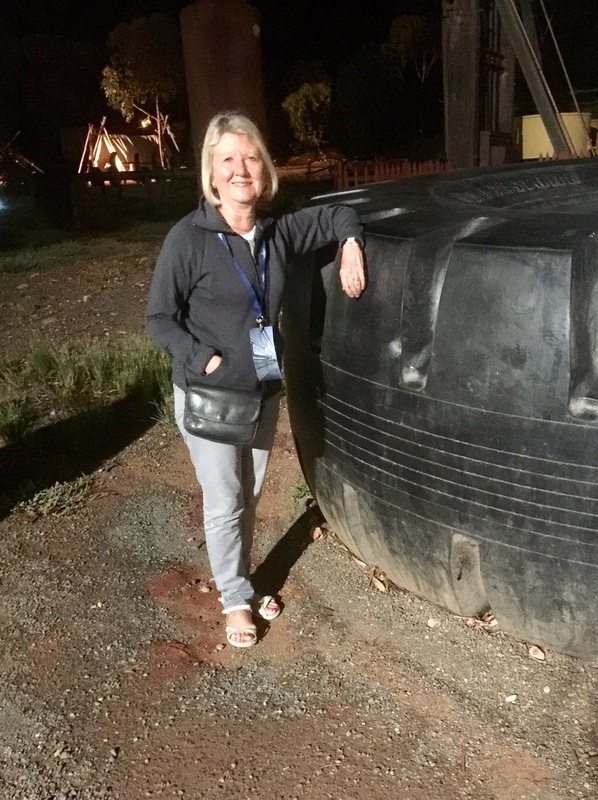 There are all sorts of stories about Kangoorlie and its colourful history. Gold found in basements, murderers let off because the killing was generally approved of and the fact Edward Hoover lived in the town for some time and left a barmaid in some distress as he returned to the US to do great things and marry someone rather special. He did send the barmaid a rather large and grand mirror to remember him! Nice touch!! 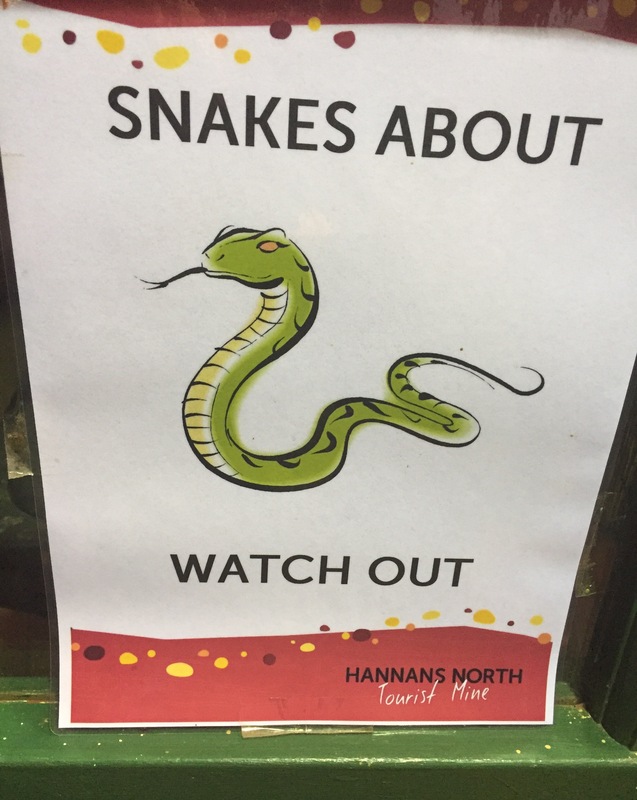 We first visited the Hannah’s North Tourist Mine where there was a short play – performed outside in a gold miners camp setting. To ward off the night chill (it wasn’t too bad actually) we were handed a tin mug with port in it – another interesting touch. The vignette made the point of the extreme conditions the gold miners experienced while waiting to strike it rich. A major issue was the scarcity of water and how expensive it was. This led to any number of problems as cleanliness was the last thing that the precious water would be used for, so disease was rife. Women were certainly in the minority and would often outlive husbands and take new ones. The mortality rate of children was high. There was little in the way of medical help. People literarily walked the 500 miles from Perth if they had no other means of getting there. The equipment was a spade and pan. A tent was a must, until a strike could mean your removal to one of those many hotels, I guess. The lottery of its day? 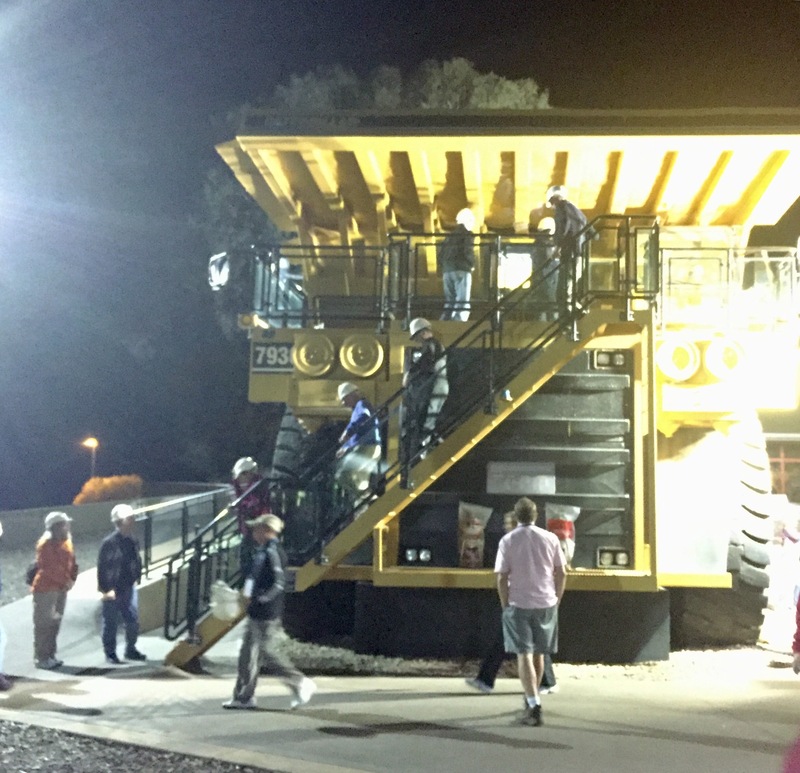 Having pondered over this and the play completed, we were taken to see up close some of current mining equipment. I stood next to the width of a wheel to one of the dumper type trucks. It was nearly as tall as me! The trucks themselves are huge and cost $4.5 million each. In the mine they look like ants. There was a scale model of the mine in the Visitors Centre. The size of the mine is unbelievable and even more so when we were taken out to see it! We would have loved to see it in the day light. Very odd to see it in the dark! However by the time it is daylight we will be well on our way to the Nullarbour (in Latin ‘no trees’) desert. The Super Pit as it is called has been in operation since 1989 and a recently found new seam will see it continuing until at least part 2021. New seams are now found by equipment flying over the location in ‘planes, pinpointing areas for exploration. The hunt for gold goes on 24/7. The big truck machines are driven by men and women working shifts of seven days on and seven days off. The current huge mine came about by all the mines in the area being bought up by a conglomerate and joining them all together. This now makes so much money that Keith’s calculator could not calculate the figure and we did not know how to articulate what it did come up with before giving up the attempt – lets just say it is sqiuillions!! 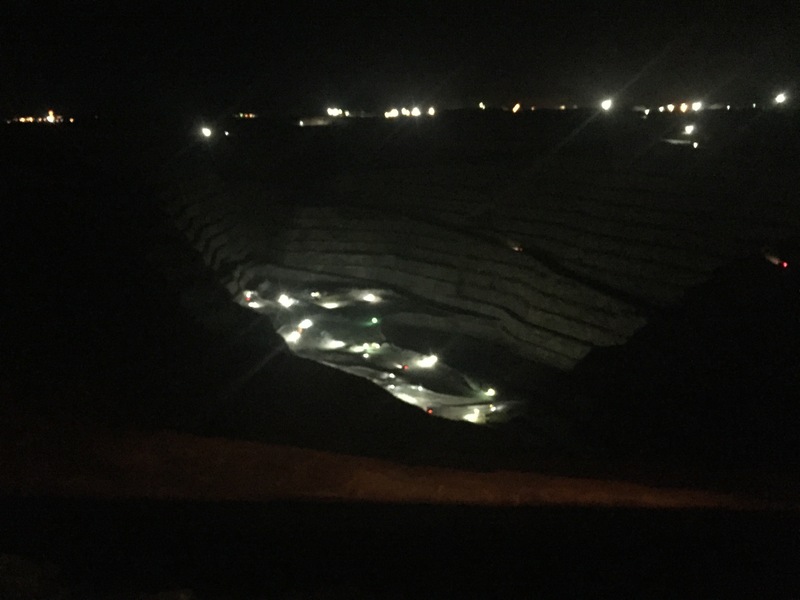 Perhaps a better picture of the mine from a magazine……..
We peered into the enormous hole, lit up to appear like daylight with minute yellow ants moving about the ridges. Photographs did not really capture the mine in all its huge awesomeness. 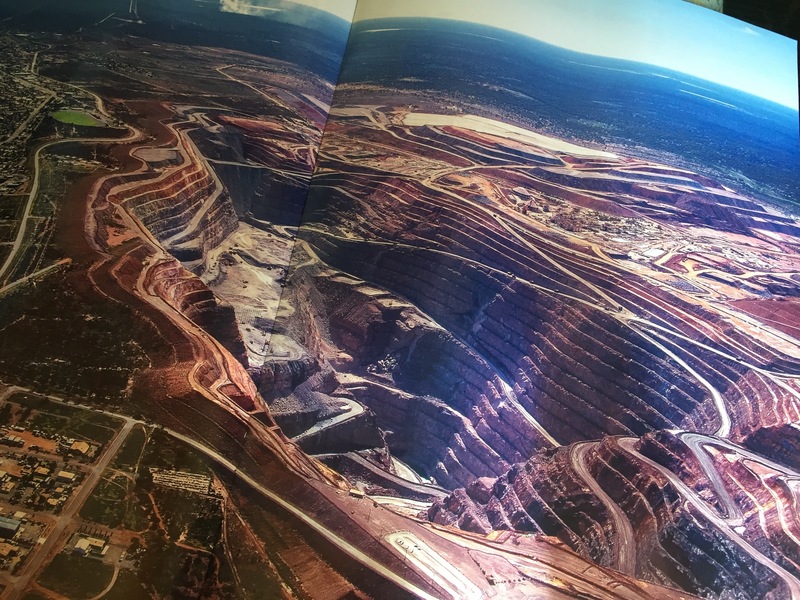 I had picked up a magazine about Kalgoorlie and its middle page spread gave a better view of the site. 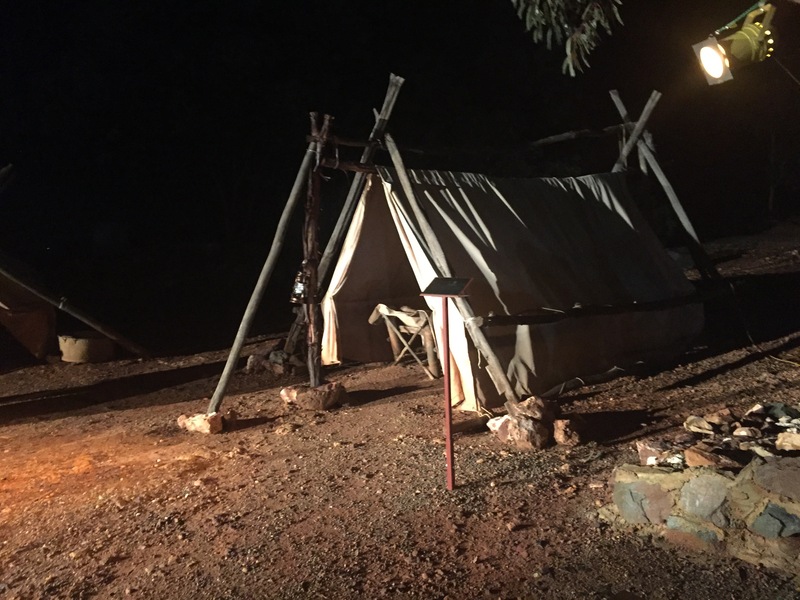 It was then time to to turn away from this modern ‘gold rush’ and move back through the dark streets of Kalgoorlie to rejoin the train, passing the Cathedral made out of local bricks, found to have gold in them……..
A sign at the tourist mine site ………. I always learn about these things after the event! Hopefully you’ve not actually seen any snakes Pauline. I remember how you reacted when we saw that grass snake swimming in the Cromford Canal!